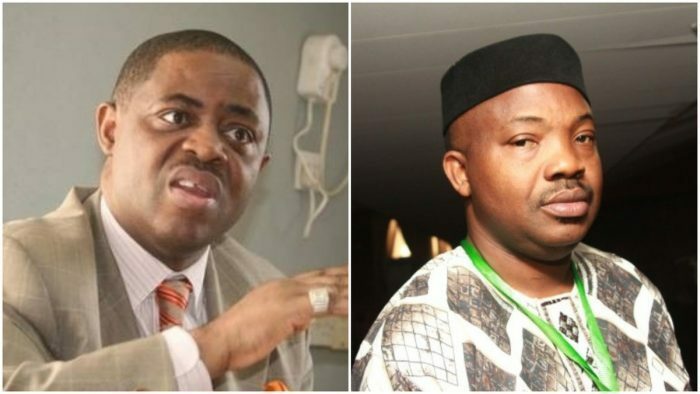 A former Minister of Aviation Chief Femi Fani-Kayode and Afenifere Renewal Group Publicity Secretary Yinka Odumakin have sued the Economic and Financial Crimes Commission (EFCC) over an alleged plan to arrest them. They joined the State Security Services and the Police in the suit filed at the Federal High Court in Abuja. The applicants, through their lawyer Chukwuma-Machukwu Ume (SAN), are praying the court to stop the respondents from arresting them over alleged false information they spread. They are demanding N20million “as damages for the unlawful threat to arrest the applicants”. Fani-Kayode had claimed that EFCC operatives surrounded Chief Justice Onnoghen’s home, while Odumakin shared a video to that effect. Fani-Kayode later retracted the publication, saying his sources misinformed him. The applicants are praying for a declaration that the respondents’ public declaration to arrest them on the basis of spreading false rumours is an infringement of their fundamental rights as enshrined in Section 34 (a), 35 (1) (4) and (5) of the 1999 Constitution. They said the threat to falsely imprison their liberty, safety, peace and security is a breach of their rights. They are praying for the enforcement of their fundamental rights and an order stopping the respondents from threatening them with unlawful arrest. The applicants prayed for an order compelling the respondents to tender an unreserved apology to them for the infringement of their fundamental rights and for “describing them in demeaning manners”. In a verifying affidavit in support of the application, the deponent Rev Emmanuel Olorunmagbe, said he was at the Online Publishers Association of Nigeria (OPAN) conference on Wednesday when EFCC’s spokesman Tony Oriade threatened to arrest the applicants. “He stated openly that while the first applicant tweeted that the EFCC wanted to arrest the CJN, the second applicant released a video on it, and that two of them will be invited and if they fail to turn up within 48 hours, they will be arrested,” the deponent said. According to them, EFCC is biased and its invitation, which they said they have not received, “is a disguised plan to incarcerate them and thwart the cause of justice”.